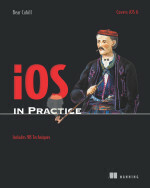 “iOS in Practice” published by Manning Publishing takes the reader end-to-end with iOS development – from the Developer Program and the Program Portal through app development and the various frameworks to distributing an app on the appstore. You can see table of contents here. Get the book here or at Amazon or Barnes&Noble. PicDecor – Allows you to select or take a picture and decorate it with some build-in images. This app is documented for development in chapter 4. In this chapter you’ll learn how to access the camera and photo album. Also, you’ll see how to layer images, move them around by touch and email the images to others. Dial4 – Allows you to filter your address book by typing in digits in phone numbers. Filter by area code, prefix or whatever digits you know for giving numbers. This app is documented in chapter 5 of the iOS in Practice. You’ll learn how to access the address book, display items in lists, filter/search via text input and place calls with the phone. Where Am I Parked? – This app allows you to remember where you parked via the map, images and text notes. This app is developed and documented in chapter 6 of iOS in Practice. Learn how to use maps, drop pins, get the user’s location and even reverse geocode to get a nearby address. TimeDown – This app is a basic timer and uses the iPhone Settings app to change the various settings within the app. Learn about the Settings bundle, changing UI programmatically at runtime, playing audio and detecting shaking of the device. This app is documented in chapter 7 of the book. PlayMyLists – This app allows you to create playlists. As a functional, but mostly for learning, app the playlists do not sync with iPod or iTunes. The app does play the music. This app is developed in chapter 8 of the book. Learn about accessing the music from the iPod, creating and storing data in databases using CoreData and playing music using iOS.